I, too, found the picture amusing. In every country–and Indonesia is not an exception– college admission is a very stressful event. It draws a lot of attention. But, none are like gaokao. Many western media tried to compare it with the SAT as the sole criterion for student to enter universities, but the similarity probably ends there. The stakes, the pressure, the meaning for the society, looks like it was at the entirely different level. But, while the photos sent a powerful message, I think it didn’t give an adequate context about the gaokao itself. There’s a lack of intimacy in the pictures. Perhaps because it was missing some important element in storytelling: character. This is where I found the article from The New York Times excels. Originally published for the Sunday Magazine, it provided a detail and intimate narrative about people who involved in the process and how it impacted their lives. The article introduces us to Yang Wei, a 12th grader whose life hangs by this thin thread so called gaokao. Through Yang, the abstract-ness of gaokao become concrete. Another nice feature is how the author chose to open the story with “a sense of places.” The description of Maotanchang, a small town in eastern China’s Anhui province, set a proper stage for a story. In the light of China’s unbelievable economic success, it always fascinating and important to see the lives of the ordinary Chinese people–not only the elites. Larmer is also an award winning foreign correspondent who has worked for over a decade at Newsweek, serving as senior writer in New York and bureau chief in Buenos Aires, Miami, Hong Kong, and Shanghai. I hope you enjoy his writing as much as I do. Oh, and make sure you read it untill the ending part. One minute later, at precisely 11:45, the stillness was shattered. 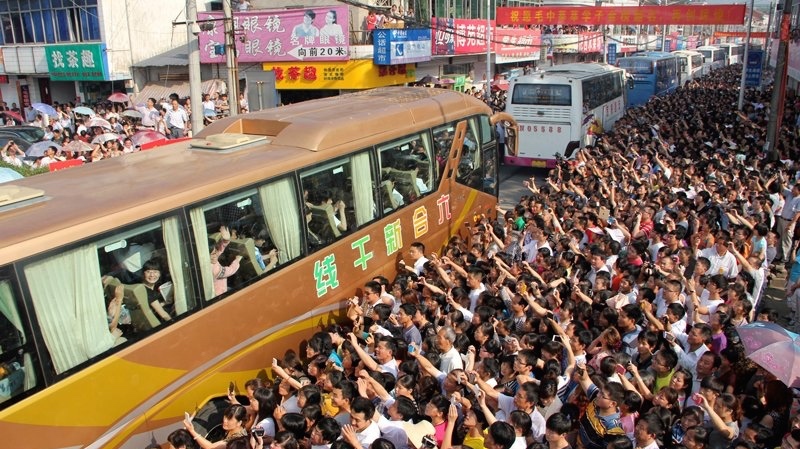 Thousands of teenagers swarmed out of the towering front gate of Maotanchang High School. Many of them wore identical black-and-white Windbreakers emblazoned with the slogan, in English, “I believe it, I can do it.” It was lunchtime at one of China’s most secretive “cram schools” — a memorization factory where 20,000 students, or four times the town’s official population, train round the clock for China’s national college-entrance examination, known as the gaokao. The grueling test, which is administered every June over two or three days (depending on the province), is the lone criterion for admission to Chinese universities. For the students at Maotanchang, most of whom come from rural areas, it offers the promise of a life beyond the fields and the factories, of families’ fortunes transformed by hard work and high scores.